Dopamine (DA) is a prominent amine that is found in relatively large quantities in type I cells of the carotid body (CB) of different mammals9. Studies have indicated that DA in the CB acts as a neuromodulator of CB function. Much evidence indicates that DA has a modulatory role which is inhibitory to the chemosensory activity of the CB. 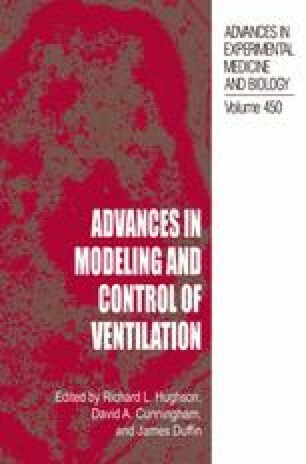 Thus, exogenous administration of DA inhibits CB discharge1,4,5,7,14,18,21–23and depresses ventilation2,5,6,10,18,22in animals and human subjects20, while peripheral DA receptor blockade stimulates ventilation and CB neural activity4,10,12,23. However, there have been a number of observations which suggest that CB inhibition may not be the only mechanism by which DA can inhibit ventilation. Ventilatory depressant effects of DA persist in hyperoxia2, 18,22and in CB denervated (CBD) animals1,2,6,22. It is not clear, however, whether these effects are mediated through dopaminergic mechanisms. In the present study, we wished to: 1) examine if inhibitory dopaminergic mechanisms are functional in peripherally chemodenervated goats and 2) determine what proportion of the inhibitory ventilatory response to DA is mediated through CB mechanisms. Our data provides evidence for both CB mediated and non-CB mediated inhibitory effects of DA on respiratory motor output in anesthetized goats.